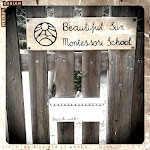 Beautiful Sun Montessori: Minor setback, plowing on. A mean little stomach virus managed to whoop me and keep me out of comission these past two days and away from the thrill of furniture building and classroom organizing. I believe the ordeal is over now though and I can resume my joyful task. We are cataloging each piece of equipment that came in the shipment and arranging things in their general areas. When the school year begins, the shelves will be sparse with materials. As the children advance through the materials, more and more of them will populate the shelves. Rugs, tables and chairs- Finally we have places to sit! There have been some major works going on in the garden thanks to parent/friend Ronald who built our beautiful sandbox, fence, and climbing stumps. This little fence separates the "orchard" from the front garden of the school. The rock paths were completed. And the tire swing hung.